The great American Civil War was over. The Union soldiers were going home. Some had been lucky; they had survived bullets and hunger, disease and surgeons. Some, a very lucky minority, had even survived the infamous Confedeate prisons at CAHABA (Alabama) and ANDERSONVILLE, (Georgia). They were brought to Vicksburg to begin the long journey home to places like Knoxville, Tennesse; Madison, Indiana; and Cincinnati, Ohio. Most were walking skeltons; many had to be carried on litters. All were in high spirits. 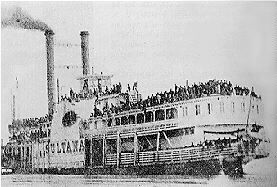 About 2,400 of them were loaded at Vicksburg onto one small steamer, the SULTANA, like so much baggage. Within 48 hours nearly 1,800 of them would be dead in the Mississippi River above Memphis- either drowned or blown to bits by the explosion of the ship's boiler. For some, death was merciful; for others, unspeakable agony. It was 2 AM, April 27, 1865, and this would stand as the greatest maritime disaster of all time in America.